All I could do is to enjoy an ice cold sorbet and few fruit pops now and then and sit back the whole day right under the AC. Yellow is psychologically the happiest color in the color spectrum. To the ancient Greeks, yellow denoted air. Leonardo da Vinci wrote that yellow represented earth. In India it is the symbol of the merchant and farmer. In 10th-century, The doors of felons, traitors, and criminals were painted yellow in France. Yellow is representative of "Greed" in Christianity. School buses are mostly painted in yellow. 75% of the pencils sold in the United States are painted yellow. Chop the mangoes into small pieces and puree it using a blender. Heat the water in a pan and add sugar to it. Keep stirring it till the sugar melts completely. Allow it to cool for a while. Now mix in the pureed mango to the sugar syrup and add lime juice and salt to it. Transfer the sorbet to a freezer proof container and put it into the freezer. Whisk to break down crystals every hour. Do this using your ice cream maker if are lucky to have one. ;) Leave it to set over night. Fill in the pop molds with the sorbet mixture and freeze it over night. Note: You can add some ginger extract or basil leaves or some cardamom to it to make it different and interesting. Its really treat for us,this series color mania! Sinful looking sorbet and pop! Absolutely delicious, refreshing and tempting summer treats, very catchy and pleasant for eyes..
Oh man .. I love your color mania ... too good da ..
amazing shots nithya. tempted to make this.surely my kids will love this. can imagine the horrible weather in chennai. Very nice presentation nithi, mouthwatering. Gud keep rocking. 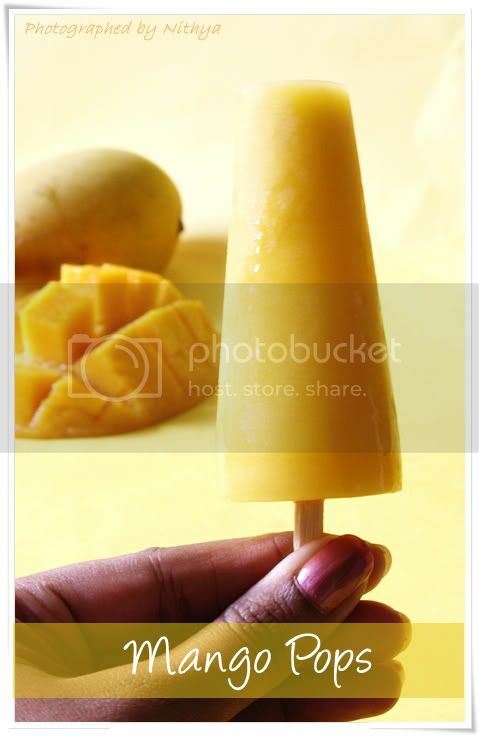 Oh boy..that's very colourful and refreshing treat...can see why you wants this treat there, even with 30 degree we all burnt here in U.K..do drop in sometimes..
Love cool refreshing mango sorbet and ice pops .perfect for the summer.Beautiful clicks. Yellow is so mu color...yes, love the cliks! Wah re wahh.. simply superb..looks soo tempting and delicious.. don't worry nithya..absolutely perfect snaps... AWESOME !!! Wow... awesome Nithya... 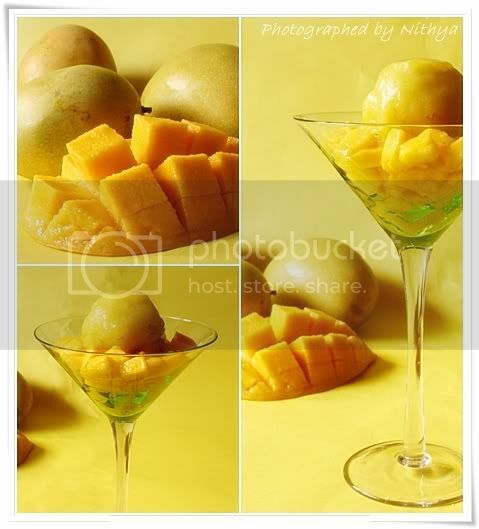 Photos are feast to eyes..
Mmm wonderful sorbet for this season.. here tooo its very hot.. could not get nice tasty mangoes.. looks refreshing.. This is really scrumptious. Looks so good. Nice recipe. YUM! wow..nithya..i m jus melting sing it..it is just awesome treat for eyes and thirsting throat..
Looks yummy and refreshing. Luved the clicks:). 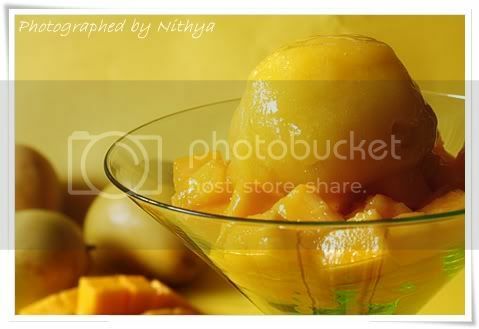 Beautiful clicks as always..looks so nice Dear..
Temptingggg....Mango sorbet looks attractive..never knew its that easy to make a sorbet..Thanks for shring nithya..
45C? Do we live next door to each other? 45-46C here too, but your post just cooled me down! Those are some gorgeous pops! WOW!! Gorgeous color. 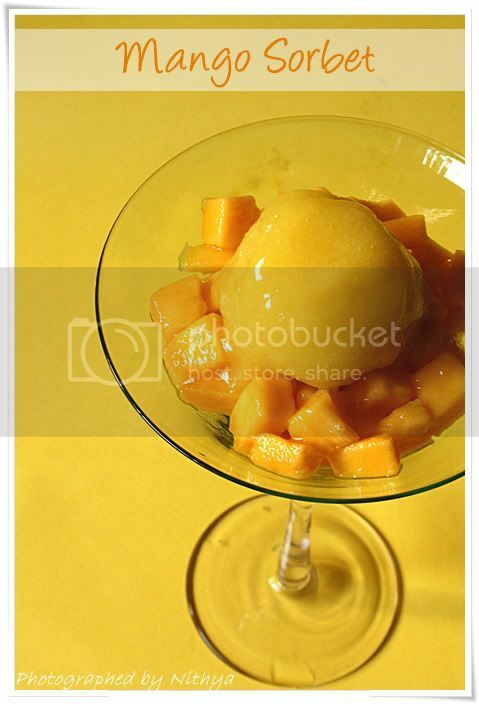 Nothing like a cold spoon of Mango Sorbet on a hot day! Good one. But i love your clicks..awesome girl! surely a delicious way to beat the heat.. fantastic capture of colors..loved your pics very much..
Looks awesome and delicious dear.. They look delicious, love that mango! 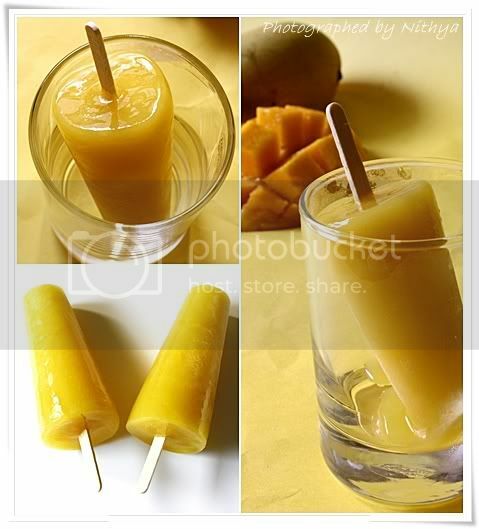 And Mango Sorbet and Pops looks very refreshing. hey lovely recipe and a lively colorful blog. looks so inviting. I liked all ur clicks. Very eye catchy.